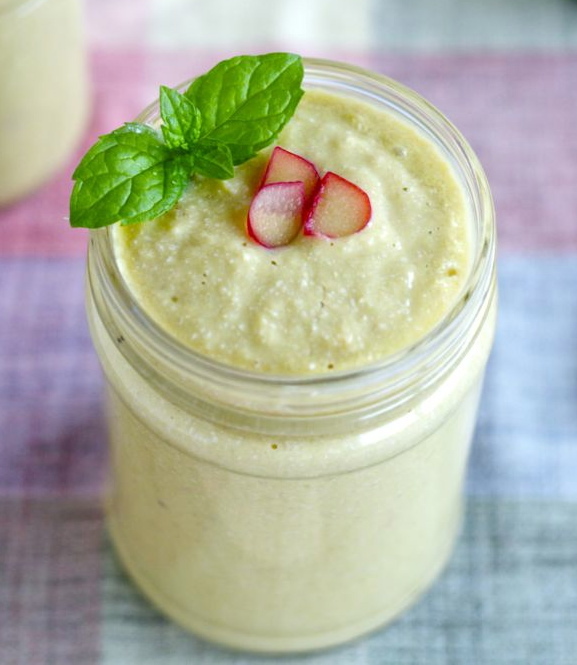 In a blender or a 1-quart mason jar (if using an immersion blender), add the mango, rhubarb, drained cashews, soy milk, water, a squeeze of lime juice and a drop of vanilla extract. Process until very smooth. If you prefer a thinner smoothie, add more soy milk or water. Serve topped with thin slices of raw rhubarb and a sprig of fresh mint. Note: You could, of course, freeze the diced mango and rhubarb for a couple of hours prior to blending.